The only thing remarkable about the asinine comments from Brexit secretary Dominic Raab about the importance of the Dover-Calais route to UK trade is that anyone should have been surprised. On this blog, we've long been reconciled to the fact that ignorance compounded by stupidity is a common accompaniment to senior ministerial rank, going right to the very top. Brexit, if nothing else, has disabused us of the myth that ministers are on top of their briefs, while the internet has given us access to material which enables us mere mortals to stay abreast of developments. That put us on a par with politicians who previously had privileged access to information and could thus always claim they were privy to details which were denied to us. It is also the case that the media – or many of its journalists – display the same levels of ignorance as their political contemporaries whom they feed, which means that we have something of the dynamic where the blind are leading the blind. Both parties, however – and their fellow travellers – seem to react to the emergence of information-rich plebs by retreating into their bubbles and ignoring them, almost completely. Instead, they doggedly reinforce and repeat their error-strewn dogmas, in the hope that their prestige and privileged access to the many organs of distribution can carry the day. The result is that information-rich individuals and groups acquire the character of an underclass, distributing their knowledge though minority channels such as blogs, watched by a small and relatively stable group of followers who profit from this new source of information, but who are rarely able to do much with it. However, the situation is not quite as clear-cut as this. Some of the legacy media commentators are occasionally able to deliver product of value, while many of the information underclass are just as capable of producing dross as the legacy media. And sometimes error is so subtle, or so pervasive, that even the discerning reader will have difficulty in deciding where to place their trust. Muddying the waters still further, we find that the deterioration of academic rigour over the last decades has produced a generation of academics who can't think, and insist on a form of expression characterised by its prolixity and lack of clarity. When my own PhD studies took me into research written up in the 1950s, I not infrequently found long-forgotten scientific material that answered some of the questions we confront today. But what marked out so many of the papers was that they were written in lucid, economic style, in plain English which was a pleasure to read and a huge aid to comprehension. We could make similar observations of the growing ranks of think-tanks which, without even doffing their caps to academic discipline, are churning out endless dross which serves only to fill space for the media which is unwilling or unable to invest in its own research and analysis. Therefore, when we had Mr Raab admitting that he had failed to understand the full extent of how much our trade relied on the Dover-Calais route, no one should have been surprised. His failing is simply part of the continuum of ignorance that pervades the upper echelons of our society. This is the same disease which prevents both media and politicians understanding the differences between a (or the) customs union and the Single Market, and keeps them in almost complete ignorance of the Efta/EEA option, to the extent that they still trot out the same errors that they were hawking around two or three years ago. That, of course, is another classic characteristic of the ignorati. Not only do they bask in the glow of their own inadequacies, they have lost the ability to learn – even from their own mistakes. Some, like Nick Boles, who famously remarked that he would sooner cut off his arm than learn about the intricacies of the Single Market, revel in their own ignorance and wear it as a badge of honour. Any sense of shame or embarrassment has long disappeared. Now, however, the failings of our political masters (and their media cheerleaders) are beginning to catch up with us. According to the Financial Times (itself no mean purveyor of ignorance), the "dawning realisation" in the cabinet that a no-deal exit could block Britain's vital trade artery in the Strait of Dover "has changed the political equation as Mrs May prepares to present her ministers with a final Brexit deal". The prime minister's allies, we are told, "say that since a no-deal exit would be too grim to countenance, the cabinet must act in the national interest and sign up to an agreement aimed at preserving free trade with the EU". Yet this is something that was quite evident in January 2017 when Mrs May made her infamously stupid declaration that "no deal" was better than a bad deal. It should have been evident to the prime minister and her advisers, to the extent that it should already have been a firm element of public policy, that a "no deal" scenario had to be avoided at all costs. Instead, up to press, all the instruments of state seem to have been dedicated to downplaying the consequences of a "no deal", and keeping it on the table as a tenable option – a line still being perpetrated by David Davis. 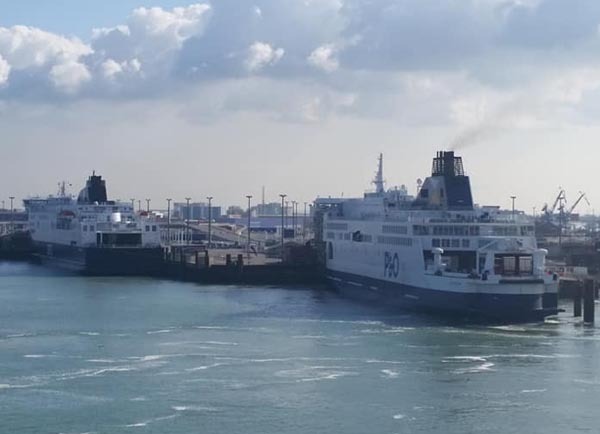 The fool dismissed fears about shortages of food and medical supplies and queues at the channel ports as "proven nonsense" and "scare stories". We have also seen Mrs May repeating her mantra at every opportunity – with an incompetent media entirely unable to discern the dangerous fatuity of her position. Now, almost at the eleventh hour, we get this glimmering of understanding which, if allowed to mature, should bring even the prime minister to the understanding that one of her central policy planks is so suicidally stupid that she should be looking to leave the country under a false name. Sadly, not only is this unlikely, it is hardly able to influence the course of the Brexit negotiations. In being so insistent that a "no deal" was better than a bad deal – and overly influenced by the need to control freedom of movement (without understanding the role of Article 112) – she has trapped herself (and us) in an exit scenario that is unattainable. Had the cabinet team, at the beginning, had at least the basic understanding of how the Single Market worked, and a clear idea of the consequences of dropping out of it, then things might have been different. But we now have to come to terms with the fact that one of the most important policy decisions of this century – if not the most important – has not been made on the basis of a calculated consideration of the facts, but in a fog of ignorance where basic information was either unknown or misunderstood. In terms of the broader sweep of politics, this presents us with an entirely new paradigm – one where a significant part of the population is better informed than the government, and where senior ministers are so badly advised – and so determinedly ignorant – that they are not only making the wrong decisions, but ones which are obviously wrong to a large number of people. As long as the governing classes could rely on monopoly access to information and perpetrate the myth that they were all-knowing, bolstered by a media that actually knew what it was talking about, then high-level ignorance was a sustainable basis for policy-making. Nobody knew enough to call out the government for its stupidity. That role was left to the historians, by which time it was too late. Now, though, we are experiencing – and recognising – stupidity in real time, without waiting to have it explained to us years after the event. And in such circumstances, it is very hard to regard our politicians with anything other than the most profound contempt – a sentiment which easily stretches to the opposition which is no better than the government it aspires to be. Where this leaves us is hard to say, but it is probably true to say that this change has been brought about by Brexit, which has forced the government to make difficult choices in the goldfish bowl of the Article 50 negotiations, where the final outcome had to be accepted by Brussels and could not be fudged. In this sense, although people are constantly dismissing the idea that there are any gains to be had from Brexit, this is one of the benefits that is already in place. The incompetence of our government did not suddenly develop. It has been with us for a long time. But the unique stresses incumbent on Brexit have served to expose it in a way that hasn't happened with other policies. Whatever else one might say of Brexit, therefore, it can be fairly confidently asserted that things will never be the same again. I will never again be able to look at those ferries across the Channel in the same light. Whether we will even see the ferries again, after Brexit, is a matter for conjecture.